A name could evoke several emotions at once. The Ford Explorer has been one of those names when, over time, you had a mix of emotions about driving one. When it first appeared on a reconstituted Ranger chassis in the early 1990s, it brought Ford into the softroader sweepstakes. They sold practically every one they built and satisfied every customer who owned one. The Explorer was simply the right vehicle to buy in the 1990s as SUVs outsold minivans for family transport. Then came the Firestore tire controversy. Not exactly a chapter for the annuals of the Explorer. Soon, those happy consumers became concerned ones. Concern turned to anger, frustration and litigation. Couple the tire issue with rising fuel prices and a SUV backlash, and you had an albatross in the form of the now-big Explorer. For Ford, the target was more the Excursion and, to a certain amount, the Expedition – two F-Series based truck-like SUVs aimed at the popular Chevrolet Tahoe and Suburban. What pushed Ford forward in family transportation slowly throttled the company in reverse. It caused a serious rethink of the mid-sized SUV. While introducing crossovers, such as the Edge and the Flex, the next Explorer was speculated to no end as to how it would be for the next decade. At the end of 2010, we received our answer. The Explorer went to a unibody set-up with a front-drive biased configuration, while ensuring a degree of off-road capability. The suite of off-road tools, including the Terrain Management System, made life simpler for those needing to go to the cabin deep in the woods or commute on a snow and ice-covered freeway across town. The Explorer also received a new generation of engines, including the 2.0litre EcoBoost turbocharged four-cylinder motor – unheard of for domestic mid-sized crossover/SUVs. Consumers responded well to the new Explorer. Sales are up, making it the fifth best-selling product in the Ford lineup. In March of 2013, 17,509 Explorers found new owners in the USA. These days, any mid-sized crossover/SUV selling over 12,000 units is doing pretty good. If the Explorer is doing so well in the marketplace, how could you improve upon it? How do you make it distinguished even further from the pack? How do you make it even more special? 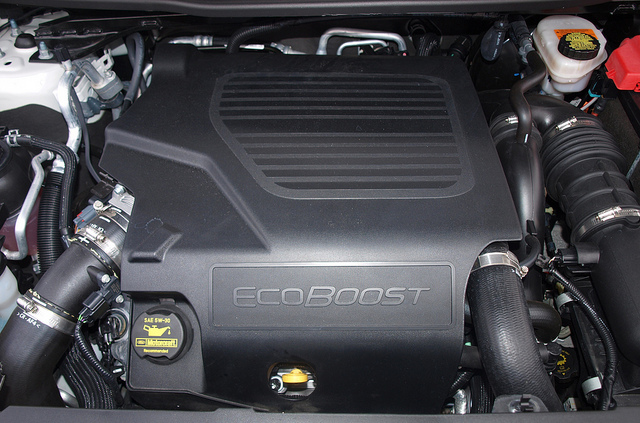 Add another EcoBoost engine to its lineup. Pick one that serves two purposes for Ford: A fuel-saving, powerful engine for the F-150 and a performance option for the Taurus in the SHO. The same 3.5litre V6 turbocharged and direct-injected engine that had been the talk of the automotive world for almost two years have found its way under the hood of the Explorer. It is not enough to drop a 365-horsepower twin-turbocharged V6 engine into a popular three-row crossover/SUV. You have to take it a step further. It has to look the part. Add blacked-out everything, twenty-inch rims, performance rubber and an aggressive-looking interior, and you get the Explorer Sport. First of all, the Sport package resolved a few quibbles I had with the current Explorer. The grille texture is more aggressive and cleaner than the multi-texture front end on other Explorers. The wheels certainly made the different visually to distinguish it from the pack. The black trim on the tailgate with smoked tail light lenses round out the Sport’s package by being as mean in the back as up front. Still, there are plenty of Explorer design cues that work well overall. There is a perception of size, which is actually an illusion when you drive it. Side mirrors may seem smaller, but are actually more useful than they seem. The Explorer actually has better visibility than most crossovers/SUVs in its class. 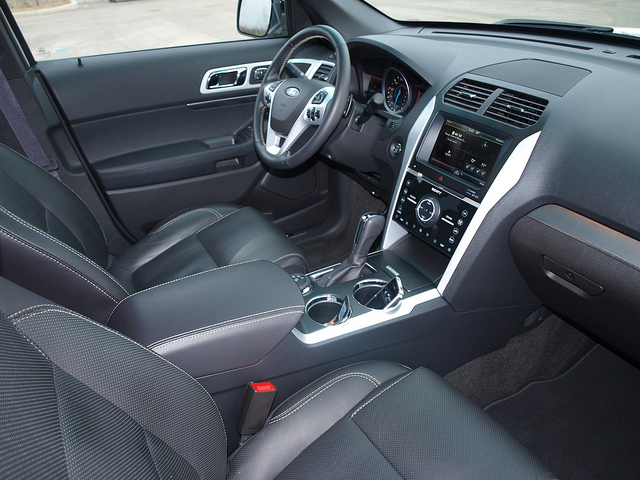 Inside is where the Explorer Sport tells its story. Black leather seats with contrast stitching invites the driver to enjoy his perch above the traffic. The seats could use some better bolstering on the sides for a sportier feel, but actually provide a mix of firm and soft spots behind the wheel. Second row passengers have decent room for average-sized adults, though the passenger-side outboard seat has an additional adjustment for greater legroom. Third row seating is strictly made for younger children. The instrumentation is of Ford’s current design with switchable TFT screens on either side of the large speedometer. If you like tachometers, the one available on the left screen may be a bit too small, but it is quite purposeful. Ford does a good job with information on either screen, which is useful for any driver. In the middle is MyFord Touch and its big TFT screen. The touch screen controls for climate, audio, phone and navigation are as comprehensive as you get on any vehicle. The plethora of light touch switches of various sorts enhanced the complete ergonomic experience. Anything you connect through the SYNC system is filtered through twelve Sony-driven speakers. Along with SiriusXM and HD Radio, you can stream your music from your mobile device either through the Bluetooth or plugged in via the USB connection. Hands-free calling is also available and quite good through SYNC and MyFord Touch. Any discussion of the Explorer Sport is supposed to begin with the 365 horsepower EcoBoost 3.5litre twin-turbocharged V6. Why wait until now? There is a not a lot to tell about this engine. This one you need to experience. It is that good! Once your foot hits that pedal, this EcoBoost springs into action. Boost is immediate, which creates massive thrust. This is not the knock-you-back-in-your-seat kind of thrust. It is controlled rage – the best term I could think of for the Explorer Sport. Controlling this rage is a six-speed automatic transmission with paddle shifters on the steering wheel. All four wheels receive this power with the Terrain Management System making things easier to find the right way to control the Explorer in most conditions. Considering the unwanted mid-April snow/slush/sleet storm we had in the Twin Cities, the Grass/Gravel/Snow mode went into action and helped ease the pain of the daily commute. The Hankook Optimo tires were just OK in terms of grip in the snow and wet. Beyond the EcoBoost and Terrain Management System is perhaps one of the best suspension systems in any vehicle in its class. When one advertises a sports suspension, it has to act like one. In the Explorer Sport, one is treated to a crossover/SUV that loves curves. It approaches them without roll or lean. Any bumps or imperfections are absorbed without any shock into the cabin. Though the ride is firmer, it is not harsh. It is balanced and quiet, near perfect. The same could be said with the Explorer Sport’s brakes. They stop shorter than most crossover/SUVs in its class and react quicker. Anti-lock brakes come on when they need and stop the 4700-pound Explorer Sport in its tracks without much drama. The steering is fine, if not a bit light in response and turning action. You need not worry about u-turns or other quick maneuvers in the Explorer Sport. In all, the driving experience of the Explorer Sport is one embedded with confidence – with a massive drop of swagger added to the mix. 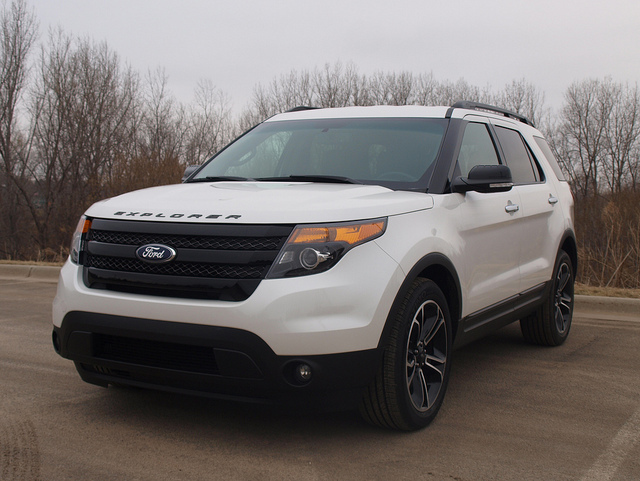 What is the biggest challenge for the EcoBoosted Explorer Sport? Whenever I get behind the wheel of a three-row, mid-sized crossover/SUV, I have to make sure I have enough money in my bank account to pay for fuel. The Explorer Sport earned a fuel consumption average of 19.4MPG. That is better than average in its class. The price of admission for this twin-turbocharged 365 horsepower prophet of controlled rage starts off around $41,500. This example, including an additional package of technology, convenience and safety features, ran the tab to $46,740. If you really like the Explorer, but would rather have something less powerful and aggressive, the lineup starts at under $30,000 for a base front-drive model. When shopping for a mid-sized, three-row crossover/SUV, you realize that you have plenty of choices on hand. 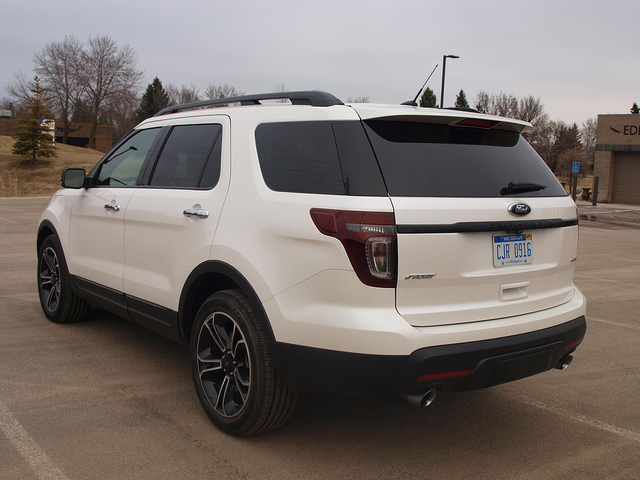 Today’s Ford Explorer is truly a great package. Minor quibbles aside, it is sized right with a great balance of performance, space utilization and road manners. If you step up to the Explorer Sport, then you may feel that you do not need to go any further in this segment. It will also make you forget about any Explorer before this one. The Sport takes the Explorer package beyond the realm of “great.” It brings back the essence of what a muscle car used to be – a performance enhancement of a run-of-the-mill mid-sized car. The Explorer Sport goes beyond that – it is truly a great road machine that is both civilized and raucous. In the past several years, I have driven my fair share of crossover/SUVs of various sizes and functions. None had the fun factor of the Ford Explorer Sport. An honest assessment for a 365-horsepower twin-turbocharged four-wheel drive three-row crossover/SUV that is truly the prophet of controlled rage.